When working in hazardous toxic environments you need a protection suit you can rely on to keep you safe from contamination. 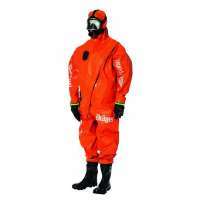 Here at Resmar we have extensively researched the market for the best performing chemical protection suits we can find and we chose two extremely high performance suits from the Drager range. Protective Chemical Suits There is 1 product. We feel that these two chemical protection suits are the best all round in terms of comfort for long duration use, low weight ventilation supply units, ease of viewing and the highest level of chemical and abrasion protection. Gas tightness is of crucial importance and these suits scored the highest overall in their class and represent the state of the art as well as offering excellent value for money. Here is a quick view of the two Drager high performance chemical protection suits we offer; Please click through for more detailed description and check the manufacturers data sheet for full technical specifications. Ideally suited to applications such as boiler cleaning, tank cleaning, maintenance and repair work as well as chemical filling jobs.